Nationals Park? Isn’t that like Yellowstone and the Grand Canyon? Firstly, Nationals Park is surprisingly not part of the National Parks system. Yes, one displaced ‘s’ can make all the difference. 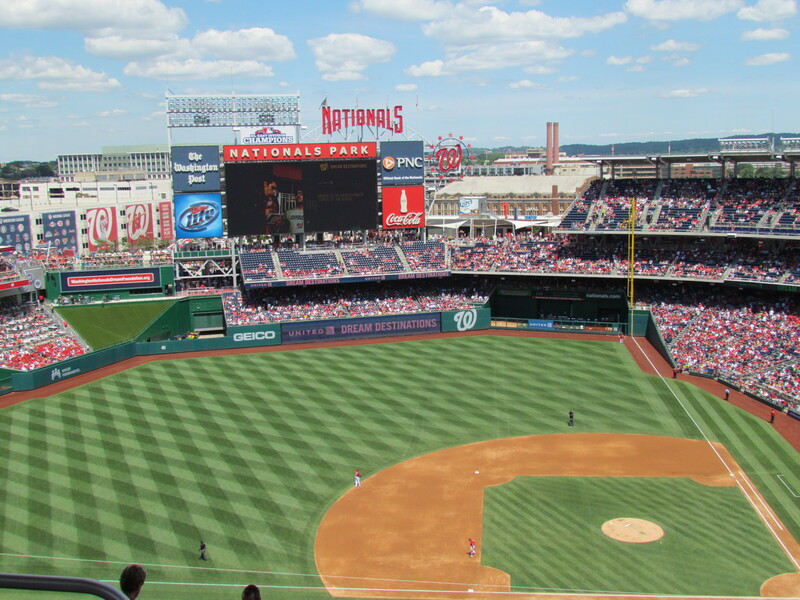 Rather than a vast outdoor wonderland, Nationals Park is an American sports stadium. The shape of this place doesn’t seem very good for concerts. 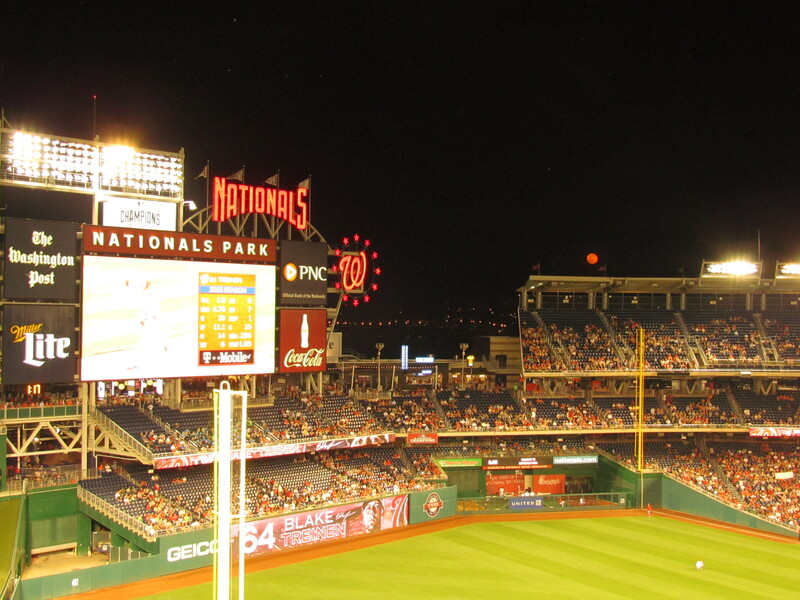 Nationals Park is in use for at least 81 days each year as a baseball stadium. Baseball, an American sport adapted in the mid-19th century, is played on a diamond-shaped, asymmetrical field. This is why the seats are arranged the way they are. 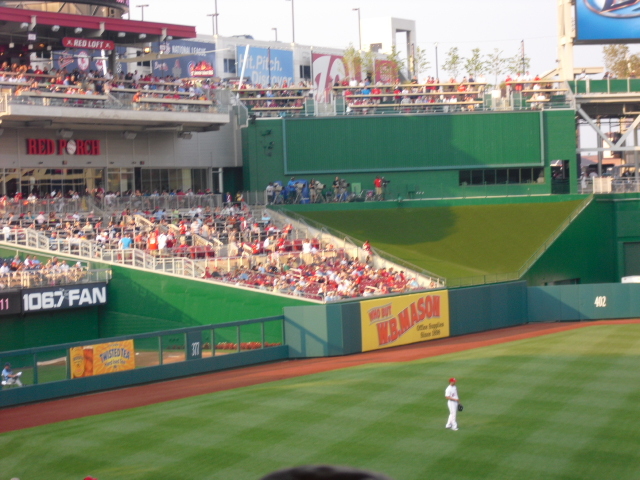 Believe it or not, Nats Park was built specifically for the purpose of housing a baseball team. Atrocious, isn’t it? Why don’t they get rid of that big pile of dirt there? That pile of dirt, ladies (and maybe a few scarce, reluctant, gentlemen), is called a “mound,” and it’s where every play in the game of baseball begins. The “pitcher” stands atop it and throws the ball, a “pitch,” to the “batter,” who stands about 60 feet away from him. And what about those big yellow things in the corners? They’re some weird-looking goal posts. Close, close. Similar to goal posts in football, the ball’s relation to the “foul poles” in baseball determines whether or not the hit is “fair” or “foul.” If a batter hits the ball, and it leaves the field of play in any area between the yellow foul poles, it is called a “home run” and results in a scoring play for the batter’s team. How about those platforms on the sides? That must be where the backup singers will stand. Close, again, kind of. Those platforms are actually roofs of small gathering spaces called “dugouts.” They’re called dugouts because they are dug out of the ground. The baseball players and coaches occupy the dugouts when they are not playing in the field. That’s a big TV up there. Is that for the people that get bored watching the baseball? You’re right, that is a screen for videos. 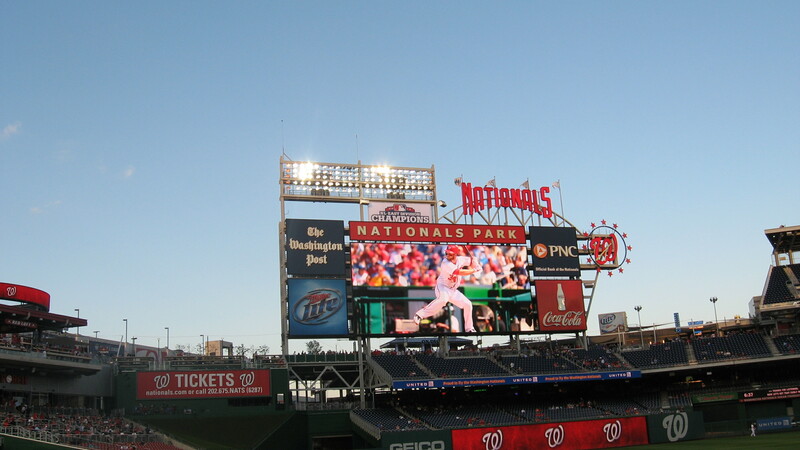 Although, it is most commonly called a “jumbotron” or “scoreboard.” During baseball games, it not only displays the score but also shows replays of the action on the field. It also lists the players’ names and some of their season statistics. If you’re lucky, they’ll use the screen to show your beloved Taylor Swift while she’s singing. I like how they have that net back there. I assume it’s to block the crazy fans from rushing the stage, right? Okay, the net is there to block something. The net blocks the balls the batter hits from striking (at fast velocities) the fans sitting behind there. If it weren’t for the net, fan injuries would be very common. Hold on, I thought you said the batter hits the ball towards the poles. Why would he hit it back to the net? Ah, I see the confusion. The batter does attempt to hit the ball out to the field, where the poles are. But the pitcher throws the ball at such high speeds that it’s common that the batter miss the ball by a few centimeters, causing a redirection of the pitch or a “foul tip,” and the ball will travel back towards the net at a result. Okay, this is starting to make a little bit of sense. But I still don’t see why so many people would come to watch this baseball stuff. Back to the concert: is that slanted grassy area out there in the middle like lawn seating? What? But you said the batter stands all the way over by the net! Just let me get there. As the batter stands over by the net, he faces out towards the field. 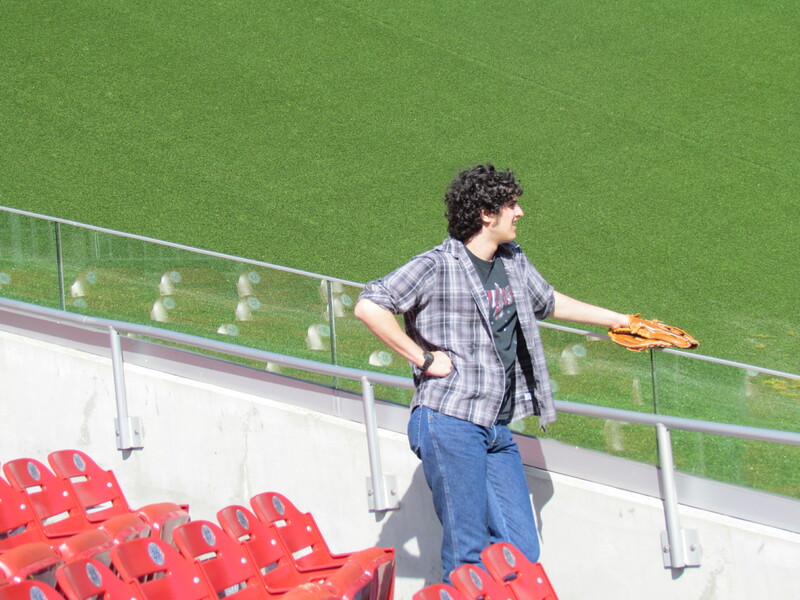 While he is watching the ball come in from the pitcher, his line of sight goes directly towards that grassy area out there. If there are fans sitting out there wearing different colors and moving around, it can distract the batter as he concentrates on the pitch. So most baseball parks put a dark colored wall or patch of grass out there so the batter has a steady background that won’t mess with his vision. Fair enough. Now, you said baseball “park” and this is called Nationals Park. What does “Nationals” mean? The “Nationals” are the baseball team that plays at this park. 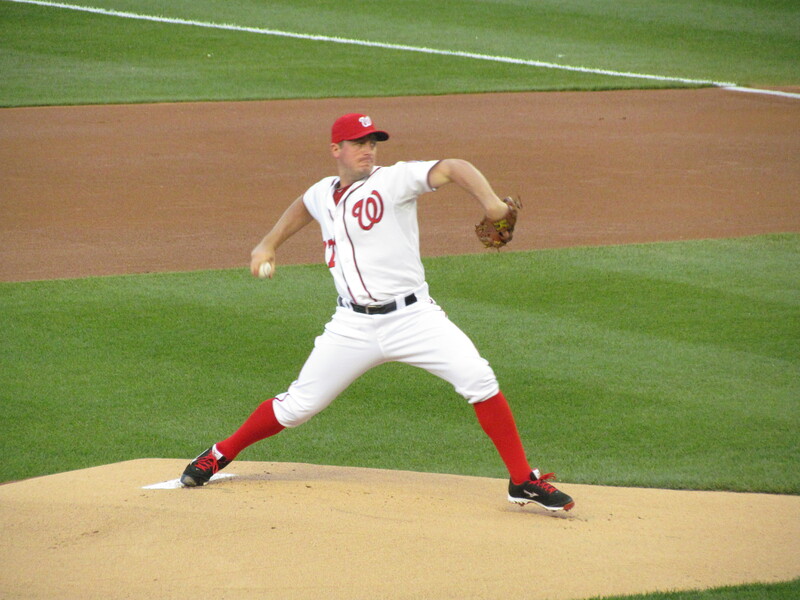 They are named the “Nationals” because Washington, D.C. is the capital of our nation. Great! Thanks for your help. But one last thing. Is this whole deal sponsored by Walgreens or something? That’s your best question yet! For all the people needing disclaimers, this article was complete satire and the questions listed here were not actually asked by any concert-goer–as far as I know. I am not intending to insult the intelligence of anyone who may be attending the Taylor Swift concert and/or not be familiar with the sport of baseball. Many thanks to my partner-in-crime Ben Lawler, who also contributed to this article. 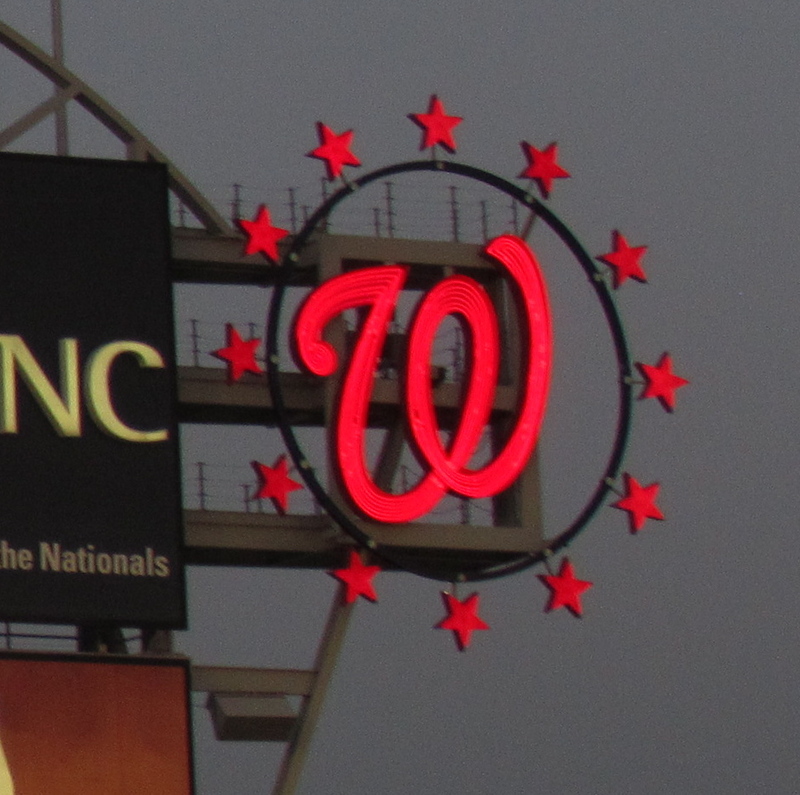 For a real review of Nationals Park, make sure to check out the Capital Conjecture, breaking down the complete seating situation–in 100 percent seriousness. Pretty funny. Almost more of a “Baseball for dummies” than a stadium guide, lol. Nats Park is a pretty awesome stadium…. even though the game I was going to see there got rained out…. Thanks, Larry. And yes, the article is supposed to be a joke, insinuating that the people who are Taylor Swift fans are completely unfamiliar with baseball. The real stadium review is linked at the bottom, and if you ever plan to ballhawk at Nats Park again, I suggest you give it a look. Haha. Loved it. So funny. I hope to visit the stadium sometime!! I think you actually have to know something about stadiums in general to truly appreciate the satire.